“As more consumers surf the Web on handsets like the iPhone 3G, the U.S. market for local mobile search will balloon from $20 million in 2008 to $1.3 billion in 2013, according to a report from the Kelsey Group. “The Mobile Marketing Association (MMA) (www.mmaglobal.com) today announced the release of an updated version of its global Mobile Advertising Guidelines. The guidelines provide the global formats, guidelines and best practices necessary to implement mobile advertising initiatives in a variety of mobile media channels, including web, messaging, downloadable applications and video. The MMA has published regional ad guidelines since 2005 and globalized the guidelines in April 2008. The guidelines are designed to encourage the uptake of mobile marketing worldwide by creating a simplified framework for brands and agencies to deliver mobile advertising in a consistent way. Released every 6 months, the guidelines process ensures that the recommendations are continually updated and reflective of global best practices and industry feedback. The new set of guidelines are the result of ongoing collaboration between MMA member companies and MMA Mobile Advertising Committee members in the Asia Pacific, Europe, Latin America and North America regions and are representative of the entire mobile marketing ecosystem. They have also received industry endorsement from industry associations such as ADMA, BVDW, DMA UK, dotMobi Advisory Group (MAG), IAB UK, Chile and Mexico. “The continued enhancement of the MMA’s global Mobile Advertising Guidelines ensure that marketers are able to quickly deploy mobile advertising campaigns world-wide in a manner that optimizes screen size and ensures consumer satisfaction. Through our Mobile Advertising Committee, the MMA continues to stay at the forefront of industry leadership for mobile advertising guidelines and education development,” said MMA President Laura Marriott. The MMA Mobile Advertising Committee member companies include: 4INFO, Inc., AdInfuse, Inc., AT&T Mobility, Buzzd, Google, Golden Gekko Ltd, GoldSpot Media, Greystripe Incorporated, GroupM, JumpTap, Madhouse Inc., MediaFLO USA, Inc., Microsoft (MSN and Windows Live), Millennial Media, Inc., Mobile Posse, MobiTX, Inc., Mobixell Networks (Europe) Ltd, Neustar Inc., News Over Wireless, Nokia Corporation, OpenMarket, Qualcomm, R/GA, Rhythm NewMedia, ScreenTonic, Sensei, Inc. Sharpcards, Smarter Agent, Smaato Inc., State Farm Insurance, Tapioca Mobile, Turkcell Iletisim Hizmetleri A.S., Unkasoft Advergaming, Verizon Wireless, Vodafone Group Services Ltd., Yahoo! The latest version of the MMA global Mobile Guidelines can be downloaded from www.mmaglobal.com/mobileadvertising.pdf. The MMA has also published a Mobile Advertising Overview white paper (www.mmaglobal.com/mobileadoverview.pdf) as well as an Applications white paper (http://www.mmaglobal.com/mobileapplications.pdf) for educational purposes. Small banner ads on mobile devices result in the same level of brand recall as a :30 spot on TV, said mobile advertising leader for Verizon Wireless Stephanie Bauer Marshall. The data, which Marshall said came from a commissioned study by IAG, also showed that mobile banner ads produce clickthrough rates exponentially higher – at 2 percent – than online banner ads, where clickthrough rates have fallen to about 0.3 percent (via MediaPost). The U.S. lags behind other parts of the world in terms of mobile advertising. 20 percent of U.S. mobile users get SMS marketing messages at least once a month, while that figure stands at 75 percent in Europe, said Dag Olav Norem, senior analyst with M:Metrics, during the Mobile Advertising Degree conference in Los Angeles yesterday (Wednesday). On the other hand, he says, 4.9 percent of Europeans receiving SMS marketing messages respond, while 12.4 percent in the U.S. do. Currently, CPMs hover between $20 and $30, but “around $20 or so is probably reasonable,” she said. U.S. mobile ad spending is projected to reach nearly $1.7 billion in 2008, up some 89 percent from $878 million in 2007, and will surpass $6.5 billion in 2012. Do You Have That Portable in a Midsize? A new category that Intel calls Mobile Internet Devices, or M.I.D.’s, will include products like these concepts from, clockwise from lower left, Elektrobit, Asus, Clarion, Aigo, Panasonic, LG, Lenovo and BenQ. THIRTY-SIX years ago, Alan Kay, a computer scientist, published a rough sketch of his Dynabook portable computer, establishing the ideal of ever more intimate personal computers. During the next decade, Mr. Kay’s tablet design, at 9 inches by 12 inches by 3/4 inch, morphed into today’s ubiquitous laptop form-factor — a term used by consumer electronics specialists to describe the different sizes of various gadgets. 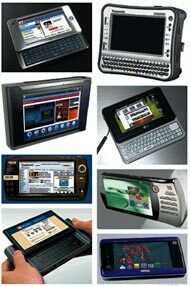 Since then, there has been a proliferation of gadgets of every size and shape, but to date only one other form-factor has established itself as a generic one: the palm-size or hand-held device that began as the Palm Pilot personal digital assistant designed by the Palm Computing co-founders Jeff Hawkins and Donna Dubinsky. An endless array of popular products, from BlackBerrys to iPhones, are descended from the Palm. This portable world is now neatly broken into gadgets that fit comfortably in your pocket and devices that snuggle equally comfortably on your lap. Is there room for a third category? Perhaps a new class of consumer gadgets that fits somewhere between hand-held and laptop? For want of a better description, I propose that we label this jacket-pocket form-factor the iMoleskine, after the Hemingway-esque notebooks that writers favor. To date, the best example of the proto-Moleskine future is the Amazon Kindle book reader, which is the size of a paperback book. A quirky first-generation effort, the device has been criticized as having an odd user interface design and a flickering display. Because of the company’s endless front-page promotional efforts on its Web store, however, the Kindle seems headed for nichedom. Intel certainly wants us to believe that there is more room in the middle. Last month, at a splashy forum in China for developers, the company initiated its effort to create a category for Mobile Internet Devices, or M.I.D.’s, for those of this middle size. If you remember Microsoft’s abortive effort around the Ultra Mobile PC brand in early 2006, you will have a good sense of the size of an M.I.D. (though it wasn’t called one). Introduced with a painfully hip viral marketing campaign called Oragami, the initial round of U.M.P.C.’s landed with a resounding thud. Entering text and moving the pointer on the screen were laborious, and text was so tiny as to be unreadable. Still, Intel has persevered, arguing that there is a “use case” — the technology industry loves jargon — based on the intersection of increasingly accessible broadband wireless networks and the Web. We are going to want the Web wherever we are. Think location, location, location. As a consequence, the Intel executives assert, the tiny cellphone display, which was ideal for viewing an 11-digit phone number or several lines of e-mail or text messaging, will be relentlessly stretched like taffy in all directions. A cynic might argue that the real reason for Intel’s sudden enthusiasm for the M.I.D. stems from the reality that its recently introduced Atom microprocessor is stuck in a no man’s land between laptop and cellphone chips. It will be another two years before Intel has a chip that will bring the Windows-compatible world to the palm of your hand. So, what to do for now, if your chips are too power-hungry to squeeze into the cellphone market, currently dominated by microprocessor chips licensed from ARM, the British chip company? If you have lemons, make lemonade! Initially, however, I bought into the M.I.D. idea. It seemed that small screens and pico-size keyboards were ill matched for the ubiquitous Web. A slim paperback book-size computer, perhaps with a Bluetooth headset to transform it into a mobile phone, might comprise the ultimate Dynabook. The sticking point in that argument is that laptops themselves are relentlessly slimming down. If you’re carrying a backpack, you can now choose among a range of ultralight laptops from Apple, Lenovo, Hewlett-Packard and Sony, as well as newcomers like Asus that are less noticeable than the four- and five-pound bricks of just a year ago. Indeed, the hottest category is machines like the Asus Eee PC and Everex Cloudbook, which sit on the dividing line between the laptop and M.I.D. worlds. Currently the Eee PC has a 7-inch screen and a keyboard that is just a bit too small to be really comfortable. My guess is that this kind of sub-ultralight laptop will grow toward a screen size of 9 or 10 inches and become thinner — moving in a laptop direction. To be sure, the caveat in all of this is that Intel may be correct in Asia, where space is at much more of a premium than it is in the United States. There are also wild cards like voice recognition that might change the equation, but conversational voice interaction with a portable computer is still probably half a decade or more in the future. At one time, I thought that an M.I.D.-size slate might prove the perfect compromise: a jack-of-all-trades media player, Web browser, communicator. I even dared to dream that it might become the perfect canvas to help resurrect my industry in a post-paper era. It’s probably just a daydream. After all, I’ve been struck recently to see that when Web sites like Amazon, Facebook and Twitter are redesigned for the iPhone, the user experience is actually better than on a full Web screen. It turns out that a high-resolution, palm-size, three-and-a-half-inch screen is just fine for seeing what your friends are up to, and for reading your e-mail and even your newspaper.